Composite picture made on Thanksgiving Day November 2006. Extra ivy compliments of PhotoShop. Dad, Mom, Lisa and Mark, Matthew, Mom Ginny, Himself, Chris, Dominic, Mia, Mary and Tony. BELOW: Brother Scott...Sister Michelle...Patrick J. Loftus (himself)...Sis Mary ...Bro Mark. Pat's brother Scott and his wife Sandy. 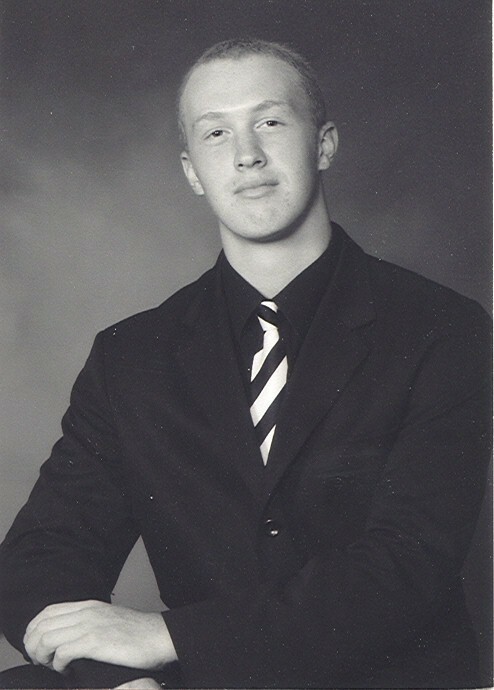 Nephew Kalin cleans up nice for his senior picture. (Dec 05). Mom Ginny with youngest son Matthew. Pat's Dad Mickey (the original Irish leprechaun) and son Christopher enjoying the links at Tanglewood in Fulton, Mo. Christopher in a rare pose and a clean shirt! Cleans up pretty good doesn't he Mom? Son Matt enjoying some giggles on his 21st birthday. Jenny's sis Edith and her hubby Logan on Christmas day 2003. Mary and Tony on their happy day. At the 2002 DaMotte Family reunion in Wilson Park: Himself with Uncle Joe Geisler, dad Mick and Cuz Ed Bushue. Nephew Kalin with his mom, Michelle. Nephew Jordan can play that Fender. This is Daisy the Wonder dog. Some time we'll tell of the three week odyssey she barely survived. Christmas at Grandma's House 2002. This fine pair of Reindeer are niece Mia and her brother Dominic. Congratulations to Sandy and Scott. I didn't know where else to put this picture. Some time ago I discovered The Mirror Project ... it is the kind of web site that makes you think creatively. The game is to take your picture reflected in something. I like the M. C. Escher quality of this reflection in our kitchen door with the patterned wallpaper background.